Today’s news review looks at coverage of former children’s laureate Michael Morpurgo’s views on school tests and the resignation of head teacher Jo Garton. Former children's laureate and author of War Horse, Michael Morpurgo, has shared his views on school reading tests and his desire for primary schools to reinstate story time. The Daily Mail, The Guardian, TES News and BBC Online have covered the story today, Wednesday 21 September, focusing on his claims that testing is taking the wonder out of stories. However, the coverage does not reflect the fact that teachers and curriculum experts were involved in the development of the key stage 2 tests to ensure they were at an appropriate standard for pupils. 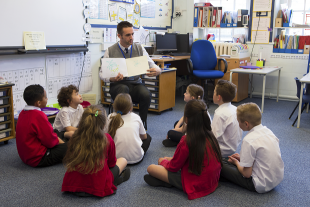 Tests in primary schools are not new but have been updated to align with a new national curriculum designed to equip pupils with the strong literacy and numeracy skills they need for secondary school. It is vital that children master the basics of reading, writing and maths early on or they risk falling behind and struggling for the rest of their lives. Assessment has always been an important part of education - we know the tests are harder and we are asking more, but we’re doing that because we are committed to ensuring opportunity for all. Tests should not be a cause of stress for pupils ‎- they are there to help teachers understand where children may need more support and we trust teachers to approach testing in a proportionate manner. Good Morning Britain this morning interviewed Jo Garton, headteacher of Bridlewood Primary School in Swindon, who claims she stepped down from her role in protest of the current assessment system for seven and 11-year-olds. In the interview, Garton explained her decision to resign and suggested that money spent on testing could have been better spent on children’s mental health services. Assessment has always been an important part of education but the government’s view is that tests should not be a cause of stress for pupils. We trust teachers to approach assessment in a proportionate manner. The programme also did not report that the government is investing £1.4 billion during this parliament in mental health services for children and young people. We are conducting a large scale survey of schools and colleges to explore what programmes they offer to support their pupils’ mental health and development of character traits. Thanks to our changes and the hard work of teachers, there are now more than 1.4 million children in good or outstanding schools than in 2010. We want that trend to continue which is why our plans will put power back in the hands of teachers, who know their pupils best. Assessment has always been an important part of education and helps teachers to understand where children may need more support. We know the tests are harder and we are asking more, but we’re doing that because we are committed to ensuring opportunity for all.